« What are the patterns of RV enlargement in various clinical entities ? What do you mean by adequate LV function . . .Doctor ? ! Among these , the term adequate LV function has caught the imagination of young cardiologists ! Especially , this description often appear in pre- operative screening echo for non cardiac surgeries . Recently ,one of my patient asked me what do we mean by adequate LV function . I told him it means nothing . . . it’s all fancy words ! but , generally it is used to imply normal LV function . . . I clarified . Think over for few minutes . . . what do we want to convey by calling LV function as adequate ? Does it mean normal ? or Just less than normal ? If adequate LV function is accepted , what is inadequate ? Adequate for whom ? For the patient ? or for the physician ? Adequate for daily activity ? or Adequate to with-stand the proposed surgery ? Even learned cardiologists indulge in this term frequently . This is rather a fancy and unprofessional way reporting LV function . They pass this style to their residents as well para medics .Adjectives in medical science are not banished . . . but should be judiciously used . 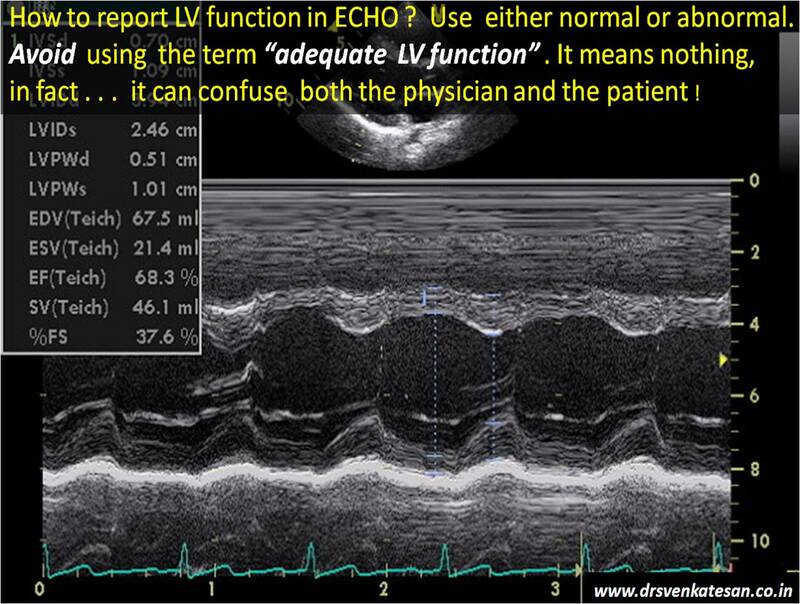 In my opinion the term adequate LV function should be removed from all echo labs . Youngsters please watch out. Related links in this site . What is LV dysfunction ?